Your kids want to hand out treats at school for Valentine’s Day, but to you this holiday is less about the candy and more about the fun message on the card. What to do? Compromise, of course. And go with more creative Valentine’s Day ideas. 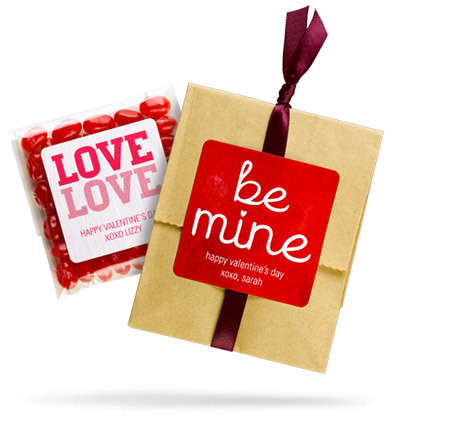 Our valentine gift tags let you plant kisses and stick fun little messages of love wherever you want. That means you can buy any treats or gifts you like, and turn them into personalized valentines. You can also use our gift tags or coordinating valentine stickers to seal your kids Valentine’s Day cards, or to decorate their treat bags or boxes at school. Stick one on the sandwich bag in his lunch, or on her mirror in the morning. Stick one on your spouse’s toothbrush or travel mug, or any one of a thousand other places. We’d love to hear your most creative Valentine’s Day ideas! Share the love and keep us posted. For more ways to get creative with valentine treats and stickers, keep reading our Valentine’s Day Ideas. Or order your own valentine gift tags and valentine stickers and start dreaming up ways to use them! ← PreviousValentine’s Day Hands on Fun!